LowellDavis.net: Christmas 2014 - it's Santa time! 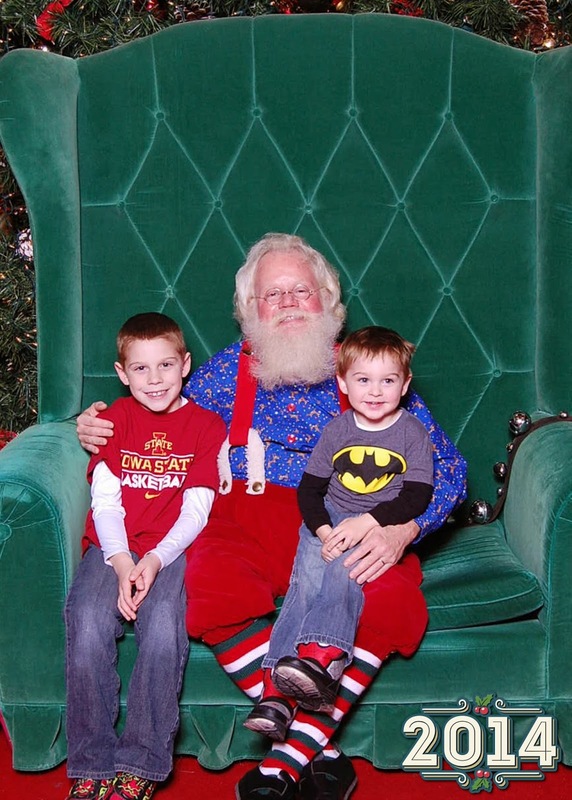 Christmas 2014 - it's Santa time! It's become a tradition for Santa to send the boys a video message each year around Christmas time. Seeing Holden's expression of awe over "HOW DID HE KNOW THAT?!" the first time Santa sent him a message a number of years ago remains a Christmas memory that I will treasure forever. I think Maddux was similarly amazed this year but seems to take things more in stride. And what would Christmas be without paying a visit to Santa Claus himself? We had planned to attend a Christmas kick-off at the Science Center but found that it had drawn enough people that, when we arrived, the line to get in was down the block to the street. We quickly decided that wasn't a great option for us so we came up with plan B - a trip to Jordan Creek to make a couple of new friends at the Build-A-Bear Workshop and to see our favorite Santa. It was a few weeks earlier than we have ever gone to visit Santa in the past and we were very pleasantly surprised to find no line to speak of which meant we had plenty of time to talk to the big man himself about what cookies are his favorites, if he gets tired when delivering toys, and various other important holiday topics. After visiting Santa, we took our new friends from Build-A-Bear to tour the Jolly Holiday Lights display which was, as usual, fantastic. Looking back now, I couldn't be happier that there were too many people at the Science Center that night as we ended up having way more fun by just playing it by ear. Some years we dress up to visit Santa. This year, since it was unplanned, we went with the casual every day look. I like it just as much as I would if they were in "Christmas picture clothes". Holden giving Rudolph (who plays the Star Wars theme when his ear is pressed) a bath while Maddux bathes Hulk (who is a Spiderman bear that plays "Let it Go" from Frozen when his paw is pressed. He also wears sunglasses). 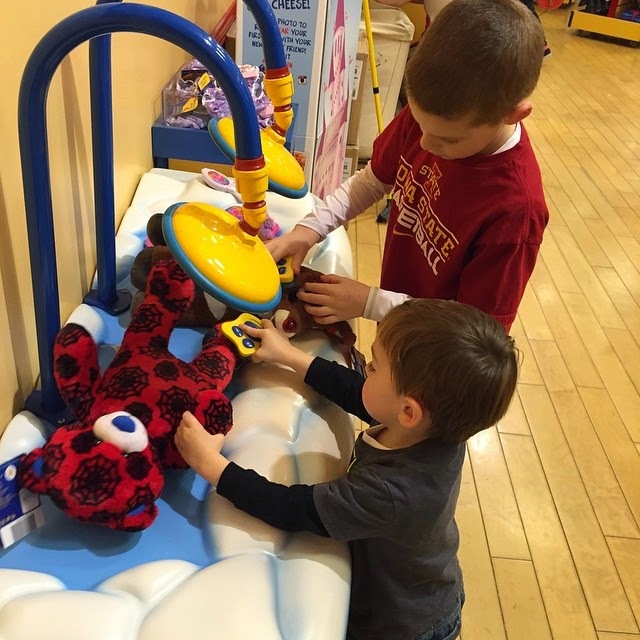 Bath time is a very important step in the creation of a new friend at Build-A-Bear. The Christmas season in 2014 has been a very relaxed, happy, and enjoyable one. I'm going to miss watching the ReindeerCam with the kids on the computer or my phone, having Jovie (our scout elf from the Elf on the Shelf) end up in a new place each night while we sleep, coming home to blue icicle lights on the house and garage, having Leah make amazing Christmas cookies, fudge, and caramels, and a hundred other things, but we've certainly added to the bank of good memories for the future.